Description: Rising star saxophonist, composer and bandleader Sharel Cassity (pronounced sha-REL) is quickly making waves on the New York and international jazz scenes with her fiery and soulful style of playing. A native of Yukon, Oklahoma, Sharel began playing saxophone at age 9. She attended the New School for Jazz & Contemporary Music followed by a full scholarship to the Juilliard School for her Master's degree. She has released two albums and appeared at venues such as the Kennedy Center, Lincoln Center for the Performing Arts, the BlueNote Jazz Club, the Iridium, the Newport Jazz Festival and Dizzy's Club Coca Cola. Besides performing with her own band, Sharel is currently a sideman with some of the most renowned jazz artists today including Jimmy Heath, Nicholas Payton, Joe Chambers, Orrin Evans, the Dizzy Gillespie All Stars and Darcy James Argue. In her debut album for Venus Records of Japan, Sharel is supported by a stellar trio of Cyrus Chestnut (piano), Rufus Reid (bass) and Lewis Nash (drums). She chose mostly well-known standards for this album and added her own spin with inventive hooks and arrangements. Her style and tone are very attractive; a good blend of deep, bluesy sound and a good amount of emotional expressiveness without being overly sentimetal. The superb musicianship of all performers elevate the level of music. This is a GREAT album by a wonderful rising star with serious talent. Recommended! Sharel Cassity is a very talented saxophonist who has beautiful tones on alto and soprano. Among her more significant musical associations so far have been Jimmy Heath, Nicholas Payton, the Dizzy Gillespie All-Stars, Darcy James Argue and Diva. Cassity can play hard-driving jazz, as was heard on her previous CD, the well-titled Relentless, but Manhattan Romance is something a bit different. Sticking with the theme of "Manhattan Romance," Cassity (with a few exceptions) performs the eight standards at slow tempos. While many young musicians sound comfortable cutting loose on uptempo material and playing double-time lines, only the most mature can caress melodies and create thoughtful and melodic solos. Sharel Cassity takes her time throughout much of this CD, never feeling that she has to fill the air with an excess of notes. She makes each sound count and gets her message across. Joined by the all-star rhythm section of pianist Cyrus Chestnut, bassist Rufus Reid and drummer Lewis Nash, Cassity starts the set with a quietly passionate version of "Besame Mucho." While this version of Jimmy Heath's "Gingerbread Boy" (the veteran saxophonist's most famous composition) starts out a little funky, it soon becomes a medium-tempo blues that has solo space for each of the four musicians. "Historia De Un Amor" returns to the romantic mood, performed with the feel of a tango. "My Funny Valentine" is taken quite slow with Cassity building her solo from the melody. "Over The Rainbow" is a change of pace. It is transformed and modernized into a modal jazz waltz that serves as an excellent showcase for Cassity's soprano. In contrast, "I Will Wait For You" and "Black Orpheus" are taken as heartfelt ballads with the saxophonist drawing out the beauty of each note while Chestnut creates soulful solos. The program concludes with a cooking version of "So In Love" that includes some brief but heated drum breaks from Lewis Nash. 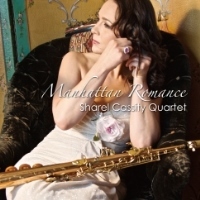 Sharel Cassity's Manhattan Romance features the saxophonist at her warmest and most romantic.